Tonight is the 25th of Tishrei, and the 198th yahrzeit of Rebbe Levi Yitzchak of Berditchev. The Berditchever is one of the legendary figures of Chassidus, revered for his enthusiastic dedication to Torah and Mitzvos, but above all for his consuming love of G-d and his people. He became known as the defender of the people of Israel. He would argue with G-d, charging Him with being too stern a father to His children, pleading for an end to the long and cruel exile. The following story is adapted from the book entitled Shlomo's Stories: Selected Tales, by Reb Shlomo Carlebach and Susan Yael Mesinai, published by Jason Aronson, Inc., Northvale, NJ. Everybody knows that the heilige Rebbe Levi Yitzchak of Berditchev and the Rebbe Reb Baruch of Medzibuzh were the very opposites of each other. 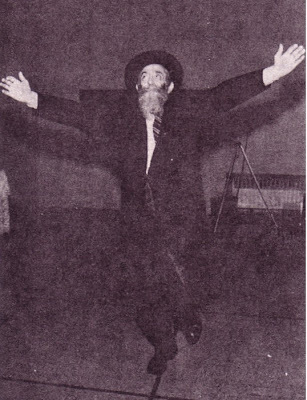 The Rebbe Reb Baruch was very civilized. When he davened, he barely moved. When he sat with his family at the Shabbos table, he was so regal he was the king of the world. But when Rebbe Levi Yitzchak prayed, he jumped from one end of the room to another. He would dance, turn around, fall to the ground. At his table, one had to be very careful. You never knew what to expect. In the middle of Kiddush, he could go absolutely wild, take the wine bottle, pour it up, pour it down, throw the cup into the air. Rebbe Levi Yitzchak wanted so much to spend a Shabbos with the Rebbe Reb Baruch, the Baal Shem Tov's grandson, that he finally invited himself. The Rebbe Reb Baruch said: "You can come, but you have to behave my way. Especially at the table, with my family, you must be very proper." Rebbe Levi Yitzchak of Berditchev thought about it. "The only way I can behave is if I don't open my mouth. I won't even pray, except to say 'Amen,' because the minute I daven, I'm no longer myself." So he said to the Rebbe Reb Baruch: "When we're making Kiddush, don't ask me to say a blessing. Let me be absolutely silent, because it's the only way I can control myself." The two Rebbes agreed. Rebbe Levi Yitzchak came for Shabbos. They davened and he only answered "Amen." The praying went beautifully. Everybody was sure that by Kiddush, Rebbe Levi Yitzchak would start jumping on the table. But, no, the Rebbe Reb Baruch made Kiddush and Rebbe Levi Yitzchak only said "Amen." Everybody knows that it's a minhag, a custom on Friday night, to eat sweet fish and sour fish. 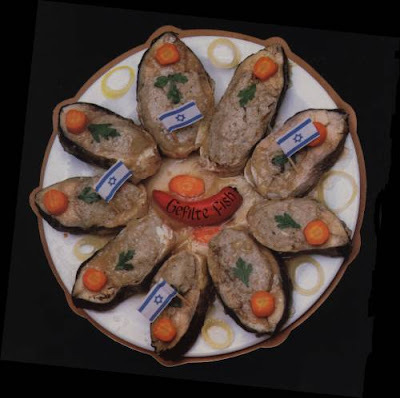 The deepest question in the world, and a big controversy among the Rebbes, was which fish to eat first. Some said sweet fish, because then you have the strength to bear the sour. Others said: "Let's get the sour fish out of the way, so that the end will be sweet." But both ways are holy. The Rebbe Reb Baruch was civilized. He had a little Chassid, like a waiter, bring the fish on a platter and ask each person which he preferred to eat first - sour fish or sweet. So the waiter came, sadly enough, to Rebbe Levi Yitzchak and asked, "Do you like sweet fish?" That's all the poor Chassid had to ask. Rebbe Levi Yitzchak said: "Do I love sweet fish? I love Hashem! I love only G-d!" And he took the whole platter of fish and threw it up to the ceiling. And the fish began to drip onto the Rebbe Reb Baruch's tallis, because in those days the big Rebbes always wore their prayer shawls for the feast on Friday night. Everyone was aghast. Everyone, that is, except the Rebbe Reb Baruch who, for all his civilized behavior, would never wash his tallis after that feast because, he said, the stains were very holy. "These stains are caused by a Jew who really loves G-d. How can I wash them out?" After the Rebbe Reb Baruch's death, the tallis was passed from one Rebbe to another to wear on Shabbos, but never washed. During this century it became so precious that the Rebbes only wore it for Yom Kippur. The holy Munkatcher Rebbe, the last to possess it, wore it only for Neila, the final prayer of Yom Kippur. He must have foreseen the destruction that would be coming into the world with the Holocaust. For the holy Munkatcher's last will was to be buried in the Rebbe Reb Baruch's tallis, covered with the stains caused by one who loved only G-d.
Zechuso yagein Aleinu v’al Kol Yisrael – may Rebbe Levi Yitzchak’s merits protect us all! "Ribono Shel Olam, Master of the World! You ordained 'a day of terua' - blowing the shofar (Bamidbar, 29:1). See how much Your children love You! You commanded a [single] terua - and they blow a hundred notes. Thousands, tens of thousands, millions of Your people Israel have blown those hundred notes for millennia. How many shofar notes have been sounded over the ages? No one can count them. But at the same time, they have called upon You with the words, T'ka b'shofar gadol l'cheiruseinu - G-d, blow just one note on Your great Shofar to herald the beginning of our Freedom and Redemption. G-d, You asked us for one terua, and we give You a hundred multiplied over and over again. All we ask from You is one tekiya. Why can't You give us just that one note?" It was the first day of Rosh Hashana in the synagogue of the Berditchever Rebbe, Rebbe Levi Yitzchak. The synagogue was crowded. The Berditchever Rebbe himself was at the amud, leading the congregation in the solemn prayers. "All declare Your Majesty O’ G-d, Who sits in judgment…"
The Rebbe's soft, vibrant voice touched the heartstrings of every worshipper. Hardly anybody's eyes were dry. From the women's gallery many a sob burst forth, loud enough to send the tears rolling down every face. "…to Him, Who searches the hearts in the Day of Judgment…"
As the Rebbe pronounced the words, his voice broke, and everybody's heart was filled with remorse. Everybody pictured himself standing before the Seat of Glory, where the judge of the whole Universe presided to dispense justice, and to pronounce the verdict. "Be merciful and gracious to us," was the inaudible plea, coming from the innermost recesses of every heart. The Rebbe recited line after line of the solemn prayer, which the congregation repeated, until he came to the line: "…to Him, Who acquires His servants in judgment..."
Here the Rebbe suddenly paused, for the words died on his lips. His tallis slid from his head onto his shoulders, revealing his pale face; his eyes were shut, and he seemed to be in a trance. The congregation of worshippers held its breath, and waited with palpitating hearts. A few moments later, the Rebbe suddenly came to. The color returned to his face, which now became radiant with joy. His voice shook with ecstasy and triumph as he declared: "To Him, Who acquires His servants in judgment!" After the service, when the Rebbe was sitting at his festive table, surrounded by his ardent followers, one of the elders plucked up courage to inquire of the Rebbe as to what caused the interruption in his prayer, and why precisely at those words. The Rebbe began to relate: "I felt myself lifted up to the gates of heaven, and then I saw Satan carrying a heavy load. The sight filled me with anxiety, for I knew that the Unholy One was carrying a bag full of sins to put onto the scales of justice before the Heavenly Court. Suddenly Satan put the bag down and hastened in a downward swoop - no doubt to pick up yet another sin, committed by some hapless Jew on this very solemn day." "Well, you know the Law, the Adversary countered, he who steals must pay double, and if he is unable to pay, he shall be sold into servitude. You are my slave now! Come! "At this point I came to,” concluded the Berditchever Rebbe. "Now I understand the meaning of the words: To Him, Who acquires His servants in judgment! We are the servants of G-d, and if we are faithful servants, G-d protects us and is our Merciful Master. Let us remain faithful servants to G-d, and we'll be spared from being servants of servants, and in the merit of this, the Almighty will surely inscribe us all in the Book of Life, for a happy New Year!" This last one is from Reb Shlomo Carlebach as it was transcribed by Miriam Rubinoff for Connections Magazine. Do you know what the most Divine thing in the world is? To forgive is Divine, it's true. But not to give up is even more Divine. Not to give up on G-d is not so hard. Not to give up on people, that is really hard - the most Divine thing a person can do. There is a most beautiful story, before Yom Kippur, the heiliger [holy] Rebbe Levi Yitzchak of Berditchev gave notice to the whole city of Berditchev that he wants everyone to come and receive his blessings -- but that it would cost one ruble. Everybody came. One way or another, they either had a ruble, they borrowed a ruble, everybody came. It was getting later and later, and Rebbe Levi Yitzchak was not going to shul yet. People were saying, it's late, it's late, but obviously he was waiting for somebody. Very late, very late -- and all of us are so late. The secret of life is to know it's never too late, but gevalt are we late! Finally, a very poor woman came. And she said to him, "Heiliger Rebbe, here is my ruble, please bless me." And Rebbe Levi Yitzchak blessed her and she went on to say, "Rebbe, believe me it was so hard for me to get this ruble. But here is my little girl with me. I don't have a ruble for her. Could you please bless her for free?" So Rebbe Levi Yitzchak says, "I'm sorry, the price is one ruble. What can I do? If you don't have a ruble, I can't bless your daughter." 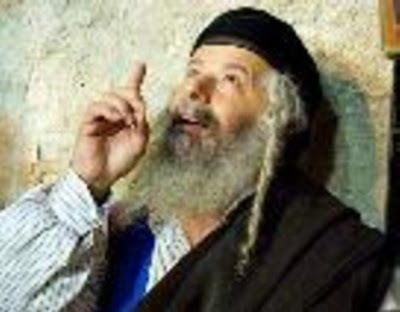 The woman burst out crying and said, "Rebbe, I have only one ruble. Take away the blessing you gave me. I don't care what happens to me ever. But please bless my child, heilege Rebbe, bless my child." Rebbe Levi Yitzchak couldn't control himself any more. He got up and he went to shul. He opened up the Holy Ark and said, "Ribono shel Olam, Master of the Universe! Did you hear what this woman said? 'I don't care what happens to me, but please bless my child.' Ribono shel Olam, how can you not do the same? I don't care what happens to me, but please bless your children." May we all be blessed in these Awesome Days!! !